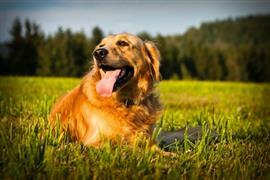 Golden Retriever owners often turn to the breed’s golden coat when looking for naming inspiration. Aside from the obvious choice of Golden, many turn to celebrities and fictional characters known for their golden hair color. On the fictional side of the fence there is Alice (from ‘Alice in Wonderland’), Glenda (the good witch from ‘The Wizard of Oz’), and Goldilocks (from ‘Goldilocks and the Three Bears’). Reese, Gwyneth, Kate, Blake, and Cameron are names borrowed from celebrities with golden blonde hair. Inspired by the Golden Retriever’s love for the water, some owners choose the names of Olympic swimmers, aquatic fictional characters, and even types of fish. Shane, Dawn, Phelps, and Thorpe are name options borrowed from famous swimmers. Ariel, Sebastian, Coral, Nemo, Sheldon, and Sandy come from fictional characters that live under the sea. Types of fish that lend their names include Marlin, Conch, Catfish, Dory, and Grouper. Since the Golden Retriever comes from Scotland, many owners choose to honor this heritage with a name of Scottish origins. Ceana, Brian, Cesan, Conan, and Taran are among many popular Scottish Gaelic name options. Some of our pages will contain a subcategory. A subcategory is a slightly more specific grouping than the main topic of the page. For a subcategory, we will include a separated table of names and corresponding descriptions. An example of a subcategory of Red Dog Names would be 'Dog Names Inspired by Red Wines'. If you have any subcategory ideas for the Golden Retriever Names page, we would love to hear them. Use the form below to submit your ideas.